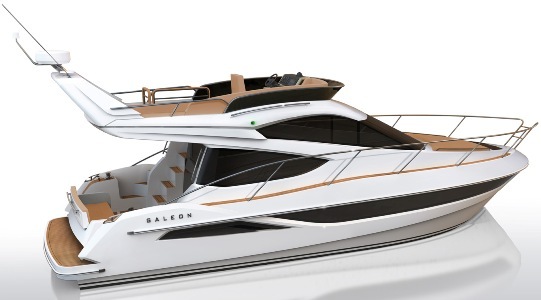 ﻿Galeon 380 Fly is a third generation flybridge motor cruiser coming from this famous Polish builder, who in the last years has taken the yachting world by storm thanks to the innovation and quality of its models. The 380 Fly is a successor to the tried and tested 390 Fly. The lines share similarities to the just launched four feet bigger 420 Fly and the new 780 Crystal flagship and yet it still is fresh and recognizable. The sporty and dynamic silhouette quickly catches the eye with its hull-length windows, aggressive lines and welcoming flybridge. Major focus was put on making the interior as bright and specious as possible. The arched stainless steel doors slide to the side reveal a cozy salon flushed with natural light thanks to the drop down windows on both sides and a slightly tilted windshield made from a single sheet of glass for perfect visibility. Outside the transformable settee with adjustable lumbar support folds out to an aft facing sundeck and has built in laminate doors to neatly close off the cockpit. The bow sundeck has conveniently placed cup holders and regulated headrest so it can be put in the upright position to create back support and become settee. Wide side decks and generously placed hand railings are great for crew while mooring and at rough sea. Another good thinking especially for Northern European buyers is the foldable radar arch and mast, which allows for an easier passage under bridges and other obstacles. The main deck will feature a comfortable dinette, helmsman station and a galley that can be moved down below in the two cabin version. Numerous interior design options with a choice of high quality natural woods allow to fully customize the yacht to suit all needs. Below deck is a choice of a three or two cabins versions, plus a separated shower cabin and head. The bow owners cabin is well lit thanks to the skylight with an integrated hatch and has numerous compartments for storage. Shaft and stern drives with joystick propulsion are available along with numerous diesel engine options.